Sun City is a luxury casino resort situated in the North West Province, amongst the Pilanesburg Mountains and bushveld. It is an oasis of sunshine and never-ending excitement; a place to relax and let go. Conveniently located in close proximity to both Johannesburg and Pretoria, it is a preferred choice for holiday-goers. Sun City is one of hotel magnate Sol Kerzner’s creations, dating back to 1979. Today, in 2011, the resort keeps making magic waves locally and abroad. The likes of Elton John and Ray Charles have performed at the famous Sun City Superbowl, while Gary Player opened up two international-standard 18-hole golf courses. The glamorous retreat provides endless entertainment for adults and children alike. Sun City consists of four hotels, which cater to every visitor’s needs, from glamorous yet affordable hotel rooms to the regal Palace of the Lost City. The luxurious palace, which overlooks The Lost City, is truly majestic in design – this architectural masterpiece depicts Africa with the most intricate details, such as life-like statues of the various wildlife. The sparkling and spacious pool is normally surrounded by patrons sipping on cocktails, soaking in the rays. The Valley of Waves will give you the slide of your life – with the Temple of Courage, standing at a whopping 17 metres; it isn’t for the faint-hearted. 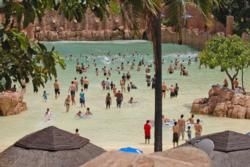 There are other activities for the young and young at heart – the advanced water park includes a wave machine, providing beach-like scenery, almost as if one is in a tropical paradise. Other slides, tubes, and the Lazy River provide plenty of activity for the day. For discerning diners, there are gourmet restaurants – perfect for lining the stomach before a night out at Sun City’s world-class casino, whilst the arcade is perfect for children. One man’s dream has lead to a first-class hotel group, Sun International, which is known for consistently providing dream summers and spectacular accommodation over the years. 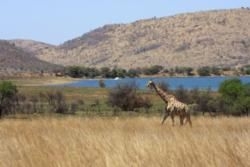 As the Pilanesburg National Park is basically a stone’s throw away, safaris are a must. For a safari with a view, climb into a hot air balloon, which will transport you through the unmistakeably African sky, the ideal position to spot the Big 5. The Pilanesberg National Park is one of the region's most celebrated game reserves, and it's conveniently located just a short drive north of Johannesburg, right next to the popular Sun City resort. It's set in the crater of an extinct volcano, and at 55 000 hectares is the country's fourth largest park. 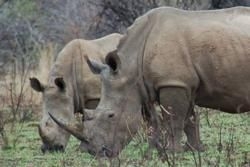 You can find all of the Big Five roaming freely throughout the Pilanesberg, as well as a number of other exciting animals, including hyena, cheetah, sable, giraffe, zebra, hippo and crocodile, among many others. It's also a birders paradise, and on the last count there were over 300 species recorded. There are a number of ways to enjoy the abundant wildlife in the park, whether you drive yourself along the 200 kilometers of roads, or take a guided drive with a qualified game ranger. You can enjoy the wild outside of your car at numerous hides, picnic sites and viewpoints throughout the reserve. There are various accommodation options scattered throughout the park, each with their own charm. Some offer superior luxury and comfort, while others offer a more authentic, rustic experience. Either way, there's a lodge or resort within the park to suit all needs, desires and budgets.